A recent graduate of the University of Alaska Southeast received a National Science Foundation Doctoral Fellowship and is accepted for a PhD position in the Department of Ecology and Evolution at the Center for the Study of Complex Systems at the University of Michigan. In addition to the NSF fellowship, the University of Michigan Graduate school has awarded Micaela Martinez-Bakker a Merit Fellowship. 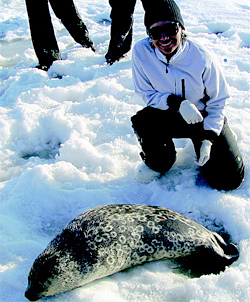 The NSF and Merit fellowships will provide Micaela resources to study infectious diseases in Arctic wildlife and continue in the field of Polar Biology. "I am very proud to be launching my graduate career in Arctic Biology and once again working with UAS Biology faculty Dave Tallmon and others in the Institute of the Arctic," she said. "Another thing I am very excited about is that I will be teaching Calculus courses for the 2010-2011 academic year in the Department of Mathematics at the University of Michigan. It is part of my graduate requirements that I teach for one year, and seeing as how I had the best mathematics professors at UAS I am not the least bit intimidated to teach these courses. It is a reflection of how wonderful the education is at UAS that such a recent graduate of the math department will be allowed to teach mathematics at a prestigious university." Micaela was named the UAS 2009 Outstanding Graduate in Natural Sciences.